When two or more fiberglass laminators meet, the discussion always turns to resin application and hand wet out tools. In some respects, this is much like a political or religious debate. I thought it might be helpful to describe some of these tools, and identify (as I see it) the best tools for laminating. The most common tool used here at Gougeon Brothers is the plastic spreader, or what we call the squeegee. 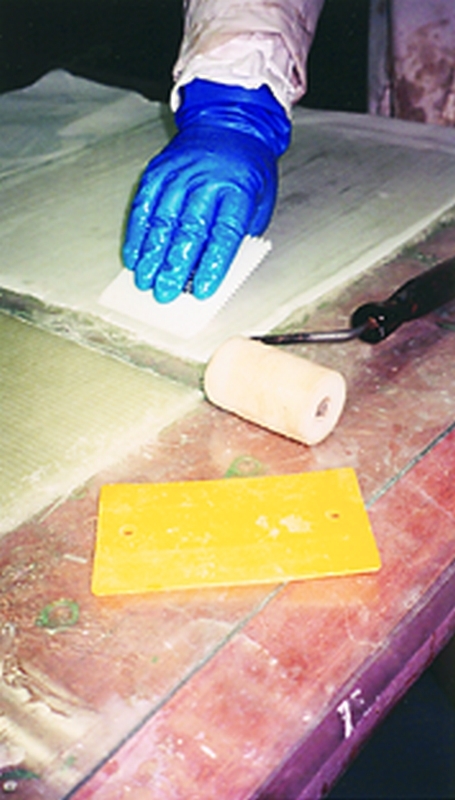 The WEST SYSTEM® 808 Plastic Squeegee is a good all around tool for most applications. This is a thin, flexible plastic rectangle used to spread mixed epoxy, force epoxy into glass fabric, remove excess resin and extract air bubbles trapped under the glass fabric. The squeegee is indispensable for removing excess resin to save weight. It’s also the most widely used tool for applying thickened epoxy putties for fairing and filleting operations. There are a couple of similar items that are frequently used in other shops for the same purposes. I personally like the spring steel version of the squeegee. It is available in most automotive body repair supply stores. This tool is stiffer than the plastic squeegee and does a better job of removing entrapped air from a laminate. By holding the steel squeegee at a low angle and using moderate pressure, you can actually hear the air bubbles popping as the squeegee passes over them. If, however, there is any curve or detail in the part, the steel squeegee has a tendency to hit only the high parts of the laminate. A major drawback to the steel squeegee is that any epoxy on it must be cleaned off with lacquer thinner or acetone before the epoxy cures. There is also a soft rubber version of the squeegee. It does a pretty good job of removing the excess resin, and is particularly useful when there is a lot of detail in the part. But, I find it is more difficult to hold on to with epoxy coated gloves, and it is too flexible for applying thick epoxy mixtures. We also use the WEST SYSTEM 809 Notched Spreader to apply thickened epoxy mixtures. This is a rigid plastic square with three notched edges and one smooth beveled edge. The notched edges, each with a different notch size, are used to apply a controlled and consistent amount of thickened epoxy on a surface. The deeper notches apply more material than the shallower notches. The smooth edge can be used as a rigid squeegee to force excess resin and air out of a laminate, much like the more pliable plastic squeegee. When laminating fiberglass reinforced plastic, you may want to get rid of all of the air bubbles, but leave much of the resin to help bulk up the laminate, or provide a better moisture barrier than a dryer laminate might. Additional resin in the laminate is required when using chopped strand mat. The only way to achieve good results in this situation is to use what is known as a bubble buster roller. These rollers force the air out of the laminate, but remove very little resin. They are machined of aluminum or plastic and available in sizes and configurations to fit most any mold detail or shape, and suit any personal preference. They may be short (1/2″) or long (6″), small diameter (1/4″) or large diameter (4″). They may have grooves around the circumference, or parallel to the length of the roller. Some even have cuts machined in both directions, making a roller with rectangular fins. There are also rollers covered with stiff bristles (mohair), used primarily with woven or stitched fabrics. The bristles have a tendency to load up with fibers when used with chopped strand mat. There are a couple of drawbacks to using bubble buster rollers. They do what their name implies—break up air bubbles, but they do not remove the air as well as a squeegee does. In some cases, rollers may simply turn a big air bubble into many small ones. In the process, I am sure some of the air is extracted, but not all. The other down side is that the rollers must be cleaned well after use, or the resin will harden on the roller, and make it unusable for the next project. The choice of tools for a particular fiberglass application project is affected by the reinforcing fabric and laminate configuration, but like religion and politics, remains a personal preference. Each of these tools has a place in the composite laminator’s toolbox. This entry was posted in Shop Tricks, Tools to Make or Modify and tagged #12, application tools, Epoxyworks #12, Fall 1998, Joe Parker on August 2, 2014 by ewadmin.